If those situations occur frequently enough in a specific credit card rewards program, I’ll consider prospectively earning those rewards instead of cash. The point is that my default mode when earning rewards currencies through credit card spend is cash back, and other loyalty currencies need to offer consistent, out-sized value in order to earn my business. Since the least valuable point is always the one you don’t redeem, I also make sure to redeem my hotel, airline, and proprietary credit card rewards points approximately as quickly as I earn them. Consider the US Bank Flexperks Travel Rewards credit card. By earning 2 Flexpoints per dollar spent at "grocery stores" or "gas stations” each statement cycle, and redeeming those points for up to 2 cents each towards paid airfare, you might think that a return of up to 4% is a no-brainer (and, indeed, I do earn and redeem a lot of Flexpoints). But last month I took a $500 voluntary denied boarding voucher on an American Airlines-operated flight. The next time I make a paid American reservation, I’ll use that voucher instead of up to 30,000 Flexpoints. Suddenly I have 30,000 more Flexpoints than I would have otherwise! Sure, I can redeem them for 1 cent each in cash back, but that’s still a $33 loss compared to putting the same $15,000 in gas station or grocery store spend on my Barclaycard Arrival+ card (or, given the categories, another even higher-earning credit card like my Chase Ink Plus). I have a commenter who always pokes fun at me when I talk about staying at dumps like the Radisson Blu es. Hotel, Rome or Radisson Martinique on Broadway just because the last-night-free benefit made them so cheap. 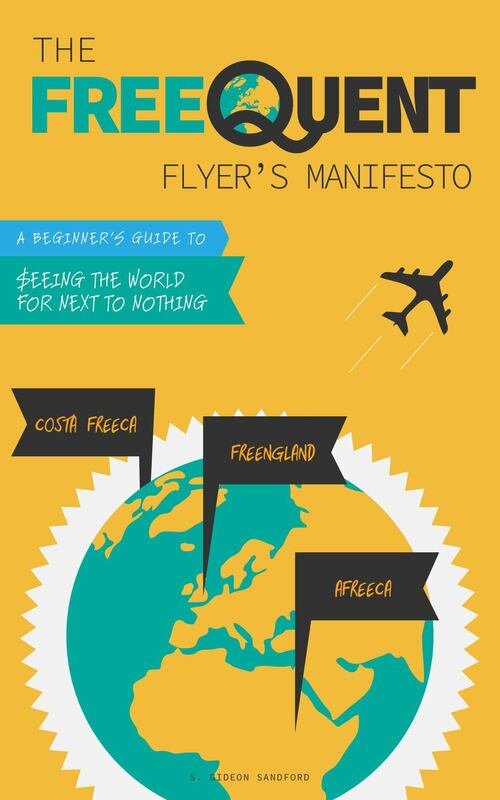 The fact is, I’m a poor person, so if I want to travel as much as I do, I need to do it cheaply. The Club Carlson credit card helped me do that. New York’s an expensive place to stay, and while I could always transfer Ultimate Rewards points to Hyatt and stay at one of their Manhattan properties, those points have an extremely high opportunity cost since they can also be redeemed for cash or paid airfare, or transferred to the right partner at the right moment. The Martinique made sense for me as an (admittedly run-down) alternative. Note: For Hilton I used a synthetic "mid tier" value of 45,000 HHonors points, which does not actually exist on their award chart; they have an even number of hotel categories. As the chart clearly illustrates, at bottom-, mid-, and top-tier properties, Club Carlson is consistently the cheapest or second-cheapest chain to manufacture stays of less than 5 nights (top-tier, 5-night Hilton stays do clock in cheaper at $281, as shown in the chart further above), even without the discontinued last-night-free benefit. The problem is that in exchange for your Club Carlson points, you’ll have to stay at Club Carlson properties, and many Club Carlson properties are dumps. Unless you have a clutch of Club Carlson properties you visit regularly, or a specific property you have your heart set on visiting, it no longer makes sense to manufacture large numbers of Club Carlson Gold Points speculatively. starting June 1, 2015, each year you spend $10,000 with the card you receive a free night at any Club Carlson property in the United States. Since the earning rate of the card hasn’t changed, all this adds up to paying $222 in foregone cash back and a $60 or $85 annual fee, and receiving 90,000 Gold Points and a free night in the United States. Even if you have to manufacture an additional $2,000 in order to “top up” your Gold Points to 100,000 each year, you’ll end up paying $266.40 in foregone cash back, for which you’ll receive at least 3 nights at any US Club Carlson property (there are no domestic Category 7 hotels). Since my partner and I visit Chicago at least a couple times per year, I’ll probably do exactly that, paying $108.80 per night for an annual 3-night stay at the Radisson Blu Aqua Hotel Chicago in downtown Chicago, which is a lovely hotel we’ve stayed at many times before (using the last-night-free benefit, of course). 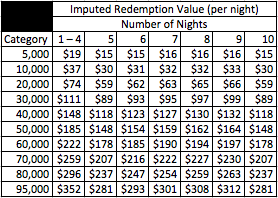 By way of comparison, the imputed redemption value of the Hilton downtown Chicago properties (ranging from 40,000 to 60,000 HHonors points, depending on the season) is $118 to $178, while a reservation at the three Category 4 Hyatt properties in downtown Chicago would cost 15,000 transferred Ultimate Rewards points (worth $150 in cash). The Club Carlson last-night-free benefit was so lucrative it justified a lot of otherwise-bizarre behavior. At the end of May, it’ll be gone, and Club Carlson will be just another middling hotel chain, packed with dilapidated, aging properties and struggling for relevance. It sure was fun while it lasted, though!